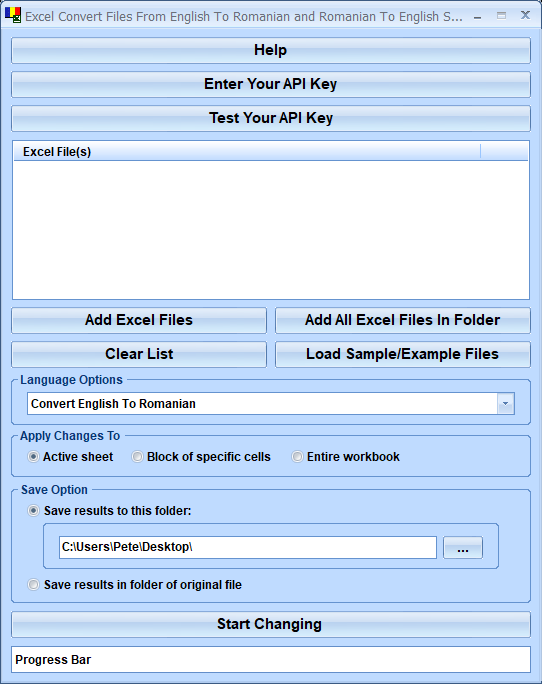 Convert Excel files from English to Romanian. Excel Convert Files From English To Romanian and Romanian To English Software offers a solution to users who want to convert Excel files from English to Romanian and Romanian to English. The user can specify a list of files or an entire folder and then choose a block of specific cells, the active sheet or the entire workbook for translation. This software uses Google Translate as the backbone for translations and requires a Google Translate API key. Instructions for obtaining a key are found within the software. Excel 2000 or higher required. Excel Convert Files From English To Romanian and Romanian To English Software is backed by a 30-day money back guarantee. If you are unhappy with the product, simply fill out the electronic form for a refund.